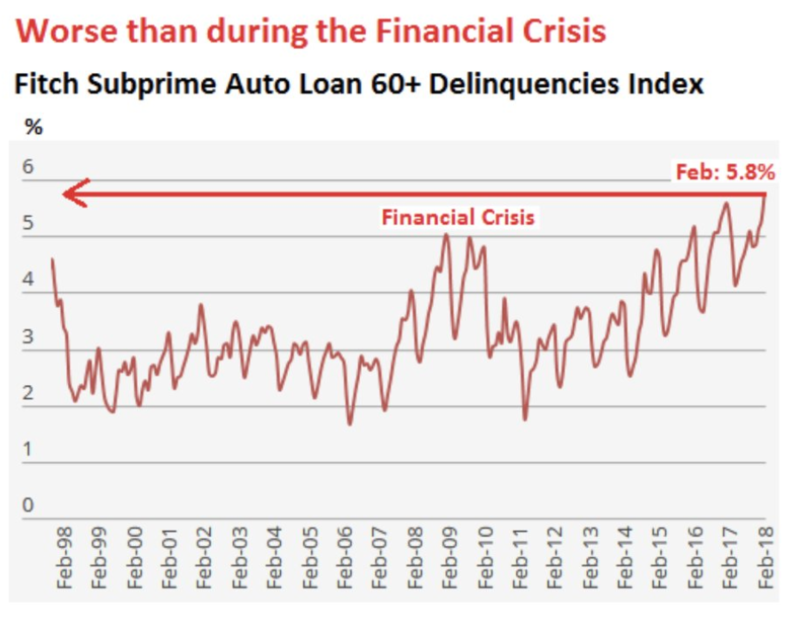 Deqlinquency rate on subprime auto loans is surging. Not a repeat of 2008. The S&P 500 reclaimed its 50 daily moving average. An irrelevant sign for the stock market. The U.S. stock market is starting to ignore China trade war news. 1 am: Housing Starts are still trending higher. Medium-long term bullish for stocks. Housing Starts increased last month from the previous month (1319k vs 1295k). More importantly, Housing Starts are still trending higher. 1 am: Deqlinquency rate on subprime auto loans is surging. Not a repeat of 2008. The delinquency rate on subprime auto loans is surging to levels that exceed that of the Great Financial Crisis. Anything with the word “subprime” in it is used by permabears to draw parallels to the 2007-2009 stock market crash. That’s why we have to put things in context. The auto loan market is 13% the size of the mortgage market. The subprime auto loan market is 24% the size of the total auto loan market. In other words, the subprime auto loan market is 3% the size of the mortgage market. Yes, the subprime auto loan bust is a problem. But it is a very small and isolated problem that’s nothing similar to the mortgage market bust of 2006-2008. This is not a medium-long term bearish factor for the stock market or economy. 1 am: The S&P 500 reclaimed its 50 daily moving average. An irrelevant sign for the stock market. The S&P 500 and Dow Jones reclaimed their 50 daily moving averages yesterday. Some people think this is a short-term bullish sign for the stock market because it means that the trend is UP. It isn’t. It’s an irrelevant sign for the stock market.